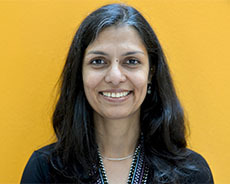 Dr. Krishnan brings a wealth of clinical experience to her role at CHC. She believes in a comprehensive approach to the diagnosis and treatment of mental health issues. She aims to facilitate a mutually collaborative approach to care with a strong emphasis on therapeutic interventions to complement the use of medications. She works to build a team of caregivers with common goals, frequently involving multiple stakeholders with an aim to utilize the various resources available in the community. She is passionate about the importance of improved access to mental health services and strives to work in diminishing the stigma surrounding mental illness at the individual, family and community level. Prior to Children’s Health Council, she worked for almost 10 years in a group psychiatry practice. There she treated children, adolescents, transitional and college age youth, adults, couples, and families while providing them with appropriate therapeutic support and indicated medications. When not working, Dr. Krishnan can be found immersed in a book (she remains firmly old school in this matter, despite being in the Bay Area). Besides being an avid reader, she enjoys cooking and is always on the lookout for new vegetarian recipes to experiment with. Dr. Krishnan also sits on the board of Taarika Foundation, a Bay Area non-profit working to raise awareness about mental health issues in children and adolescents. Self-Esteem and the Growth Mindset: How to learn from failure?